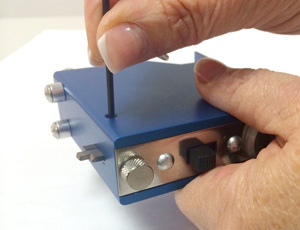 Direct measurement of total coating thickness, and thickness of individual coats of paint is a unique capability of the “Tooke Gauge.” Thus, in addition to routine use, it often serves as a “referee” instrument to calibrate indirect or “non-destructive” thickness measuring instruments. Other uses include assessment of substrate conditions and coating adhesion, and observation of microscopic cracking, tendency for brittleness, blistering, cratering, or other microscopic film symptoms. 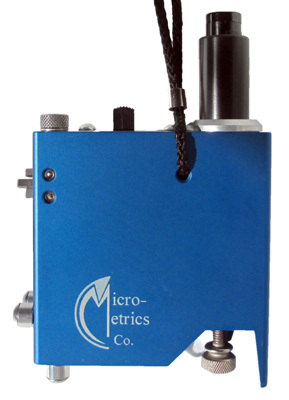 Measures Thickness of Coatings Applied to Wood, Plastic, Cement, Glass, Ceramics, Mirror Backings, Metal, Etc. Assists in Measuring Brittleness and Adhesion of Coatings and Materials. 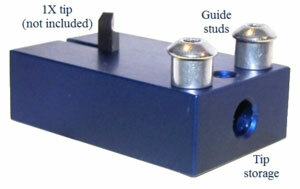 Model OG202 & OG204 are supplied with 1X, 2X, & 10X cutting tips installed in the gage body. The 2X tip is shown extended to working position. Open the carrying case and remove the instrument. For field use, secure the safety lanyard to the wrist to prevent accidental dropping. Check the positioning of the cutting tips. As originally supplied, the tip positions will be from top to bottom 1X, 2X, and 10X. The numerals 1, 2, and 10 are engraved in the body alongside each tip respectively. The 1X and 10X tips will be bottomed in their slot, thus protruding about 3/16" from the case. The 2X tip (center position) should be in working position, thus protruding about 5/16" from the case. In general, this is the correct configuration for making an initial measurement on a film. Make a small mark with the marker at the desired measurement location on a painted surface. Grasp the instrument with the cutting tip down as shown in Fig. 2. Place the cutter tip and guide studs in firm contact with the surface with the tip slightly above the mark and aligned to scribe across the mark. Align the forearm with the intended cutting direction to assure a straight cut. Draw the cutter tip straight across the mark, applying just sufficient pressure at the tip to cleanly penetrate through the film into the substrate. In this operation, the cutter trails midway between the two guide studs, and continuous 3-point surface contact should be maintained to ensure precise vertical alignment of the groove. Excessive pressure on the guide studs should be avoided. Turn on the microscope lamp with the slide switch on top of the case next to the eyepiece. Center the foot of the microscope on the scribed line with the mark about one-quarter inch from the foot directly under the microscope objective. Check the microscope for focus. If the image is not clear, it may be brought into sharp focus by turning the focusing screw in the body below the microscope. This may be quickly accomplished by using the supplied hex key wrench to loosen the tip set screws. Allow all three tips to bottom in their slots, then pull the selected tip out to 5/16" (approximately) and retighten all tips with moderate finger pressure. 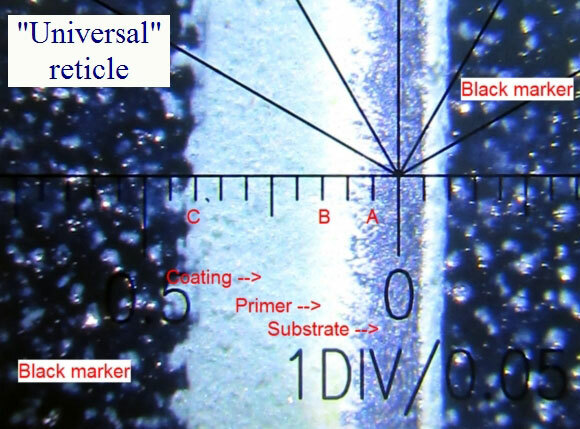 “Line A” is on the edge between the substrate and the beginning of the primer-coating: begin your measurement there. “Line B” marks the top of the primer coating/beginning of the top coating (light blue). “Line C” is the incision into the top coating, made easier to see by using the black marker provided with the Tooke Gage. This count divided by the tip designation (2) is the film thickness. If the result should be less than 2 or more than 20 mils, the inspector may wish to utilize 10X or 1X cutting tips respectively. Fig. 4. Micrograph of paint film incision. Similarly, other groove angles may be cut for convenience and precision of measurement of coating films over a wide range of thicknesses. Fig. 1. 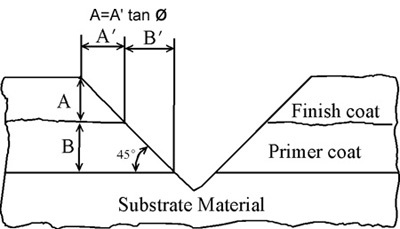 (A) Geometry of Thickness Measurement. (B) Grooves of 1X, 2X, and 10X Cutting Tips. Please take note: All Tooke gages produced after June, 2010 now use a Universal reticle. The chart below shows the incremental reticle divisions for all current gages manufactured after June 2010. The OG204/202 Paint Inspection Gage is now equipped with a Universal Scope. The OG202 gauge body, cap, and focusing ring, are machined aluminum. The OG204 gauge body is made of injection molded high-impact plastic. It contains the microscope and lamp batteries as well as the groove-cutting tungsten carbide cutting tools mounted on the narrow side. In addition to the cutting tools, two adjustable threaded guide studs also project from the body on the same side. The tripod thus formed by the three legs (guide studs and tool) provides for precise alignment of the tool with a surface to be grooved. A lanyard and keeper looped through the body secure the instrument to the inspector’s wrist. A plastic (polypropylene) carry case with foam inserts to carry your Tooke Gage and spare parts: marker, wrench, LED bulb and spare batteries. The entire unit is designed for convenience and completeness in field inspection tasks. Original factory calibration is accomplished by setting the guide studs in precise geometric alignment with the cutting tips. Checks are also made with precision applied film standards. For highest precision work, the user is advised to maintain painted panels of known thickness, and to check and calibrate the instrument measurements periodically. On wood or other directional material, make incisions in the grain or “machine” direction to avoid ragged cuts. Soft or elastic materials can sometimes be cooled or frozen with ice or dry ice to obtain good cutting characteristics. Dyes or indicator solutions such as phenolphthalein are sometimes helpful to develop appearance contrast between metals (iron-galvanizing) or paint coats. Eraser “white-out” fluid may be useful as a benchmarker on dark surfaces. With some coatings, improved cuts can be achieved by wetting the surface, or by speeding or slowing the cutting rate. 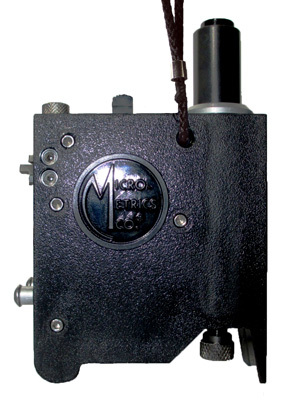 The Tooke Gauge has been used to assess sandblast cleaning work, to measure plating and paint thickness on ceramics, metal, wood, and concrete, and even to measure protective backing thickness on mirrors. It is virtually the only tool for measuring paint on plastics. As indicated above, the quality of the incision in the film discloses much about characteristics of brittleness and adhesion of the material. In addition to the benefits as a dry film thickness gauge, the Tooke Inspection Gauge (PIG) offers the advantages of a close inspection tool. Abnormalities that would otherwise go undetected by conventional electronic or magnetic gauges include pinholes, adhesion faults, deteriorated substrate conditions, and lack of overall coating integrity. 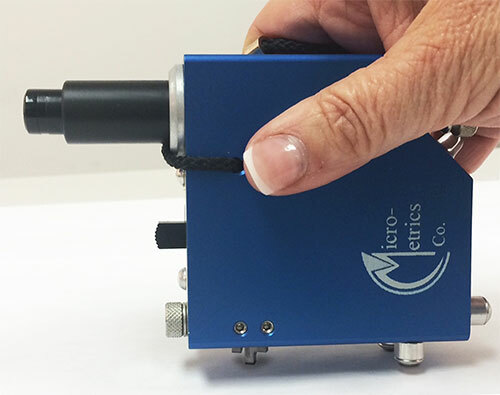 Consider the Tooke Gauge as an excellent adjunct to the conventional DFG and even more useful as a verification tool for the more exotic ultrasonic instruments. The CTH01 Cutting Tip Holder, at a little under two inches (4.1cm) long, allows easy use of a carbide cutting tip without having to manipulate the Tooke Gage to make the incision and then manipulate the gage again to view the incision through the microscope. Make multiple incisions with your most-used tip without having to return the gage to viewing position multiple times. The cutting tip is secured by two set screws, one on the short end of the holder and one in the side. The wrench provided with OG202 and OG204 Tooke Gages fits these set screws. The two set screws give 90° support to the cutting tip. The cutting tip storage compartment on the opposite end holds two tips secured by a compartment retaining screw. CTH02 Double Cutting Tip Holder allows two tips to be mounted on opposite sides and, like the shorter, single cutting tip holder (CTH01), allows easy use of the cutting tips without having to manipulate the Tooke Gage to make the incision and then manipulate the gage again to view the incision through the microscope. Make multiple incisions with your most-used tip(s) without having to keep switching the gage to viewing position. Mounting two of the same tips allows for checking two incisions against each other. "Bracket" your incisions by mounting two different tips to create different incising geometries. OG202 OG204 DF-OG200-CASE - (Included with Gage) Case made of polypropylene with foam inserts to carry your OG202 or OG204 Tooke Gage and spare parts. Has a convenient carry handle, closes securely with two latches and stands upright on two molded feet. “A Paint Inspection Gage” by Raymond Tooke, Jr., OFFICIAL DIGEST, July 1963, 35, pp. 691-698. “Coatings Adherence Measurement By An Angular Scribe-Stripping Technique” by W. R. Tooke, Jr. and J. Montalvo, JOURNAL OF PAINT TECHNOLOGY, January 1966, 38, pp. 18-28. “How Instruments Boost Coatings Application Productivity” by W. R. Tooke, Jr., PROFESSIONAL DECORATING AND COATING ACTION, October 1976, pp. 16,18. “Method and Device for Measuring the Thickness of Films” by W. R. Tooke, Jr.
OG202 - Complete with illuminated microscope, three cutting tips, felt tip marker, allen wrench, plastic (polypropylene) carry case and instructions.